Energy giant Ineos has completed its acquisition of the Forties Pipeline System (FPS) in the North Sea from BP. The $250m (£199m) deal sees Ineos take control of a system that delivers almost 40% of the UK's North Sea oil and gas. The 235-mile pipeline system links 85 North Sea oil and gas assets to the mainland and the Ineos site in Grangemouth. 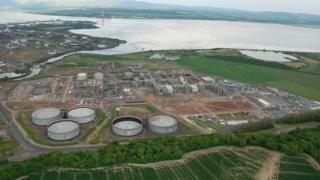 The deal also includes the Kinneil Terminal. About 300 staff will transfer to Ineos FPS Limited, a newly-formed business that will be part of Ineos Limited. Chief executive of Ineos FPS, Andrew Gardner, said it was a "very significant deal" for the company. "The acquisition reunites North Sea and Grangemouth assets under Ineos ownership," he said. "Ineos is now the only UK company with refinery and petrochemical assets directly integrated into the North Sea and this deal provides the platform to potential future offshore Ineos investments." The Forties pipeline was opened in 1975 to transport oil from BP's Forties field. A 105-mile section brings oil from the offshore Unity platform to a facility at Cruden Bay in Aberdeenshire. From there the oil travels through an overland section to Kinneil. Today, the pipeline system has an average daily throughput of around 445,000 barrels of oil. Under the terms of the deal announced in April, Ineos was to pay BP $125m (£99.5m) on completion and an earn-out arrangement over seven years that totals up to a further $125m. Ineos said it has now taken on ownership and operation of FPS, the Kinneil gas processing plant and oil terminal, the Dalmeny storage and export facility, sites at Aberdeen, the Forties Unity Platform and other associated infrastructure in the deal, which consolidates its position as a top 10 company in the North Sea. Mr Gardner added: "Our acquisition of the Forties Pipeline System and associated assets together with its highly skilled workforce is significant and strategic. "It demonstrates Ineos' commitment to securing a competitive long-term future for this critical piece of oil and gas infrastructure and provides the platform to potential future offshore Ineos investments."